I’ve had some very strange swings in my personal opinion on “fair trade” throughout my life. At first, I thought it was a silly concept for reasons I no longer recall. But then I read Peter Singer’s take on it, who suggested that it basically is just the consumer being willing to pay a little extra in order to ensure that the farmers have a better quality of life and the idea of fair trade made sense to me and I wanted to participate. But then I stopped being sure that fair trade actually was substantially improving the quality of life of farmers. And I realized that if the extra price is essentially a donation to improve the quality of life of farmers, shouldn’t I be concerned about how that donation could go further? (See also.) Now I avoid buying fair trade things, but personally donate the difference between a free trade and fair trade good to the best non-profits I can find. Overpopulation is not a problem because innovation continues to increase the carrying capacity of Earth. With our pre-agriculture technology, we probably could only have sustained a few million humans at most. 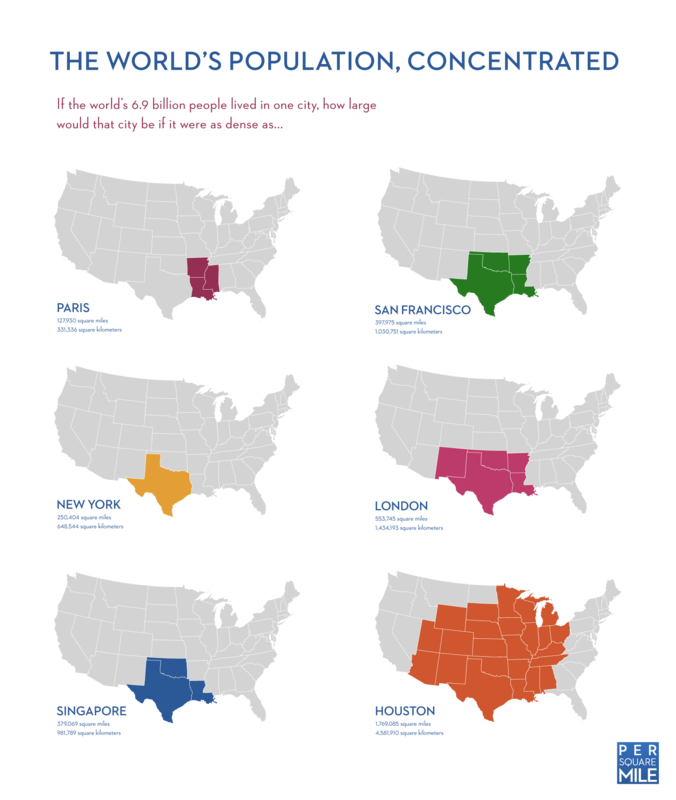 Reminds me of how, if everyone lived in a New York City level population density, we could fit the entire world population in Texas. Also, that thing with people living inside or outside this circle. Julia Wise tells about living on the amount of food that food stamps could buy, which is $200 for a single person, and actually finds it pretty easy. She even gives tips. This is something I’ve thought about a fair amount – while I think the struggles of the US lower class are important and difficult and shouldn’t be trivialized, after reading a significant amount of Mr. Money Mustache, I’ve become surprised at people finding living at $20K per year difficult. After all, I personally only spend like, maybe $115 tops per month on food. But I don’t really know much about the harsh realities of being poor, so I’m probably just speaking from ignorance here. Cal Newport says you shouldn’t use a to-do list. Well, actually, that’s just a sensationalist title for a more nuanced point – you should use a to-do list, but block out time in your schedule for each task based on your estimate of how long the task will take. I’ve gone back and forth on whether I like this “timeboxing” technique. Right now, I’m not doing it, but this article has convinced me to try doing it again. The US might save lives with military strikes, but are these strikes cost-effective? Could the US do better by putting the same amount of money into, say, anti-malaria bednets? Despite arguments that the military is wasteful, the answer seems unclear. Ten tips for animal activists based on the work of Henry Spira. Key ones: understand public opinion and how it can be changed, set achievable goals, be credible, don’t demonize people, present solutions instead of problems, and be ready for confrontation. The problem with libertarianism in a nutshell. I tend to agree that the US is simultaneously overregulated and underregulated. Were the Ancient Greeks a much smarter and better society than the one we have today? Probably not, for non-obvious reasons. This is what I would be like if I ran an advice column.